Happy Friday 'erbody! Can I get a Whoo hoo?? _______! I left that space for you to whoo hoo. Another weekend is upon and I could not be more thrilled. I have been pretty stressed lately with work, balancing outside activities and studying for my license test. How do people fit everything in? Needless to say taking care of myself has been a must lately. Which is why Birchbox has come back into my home. 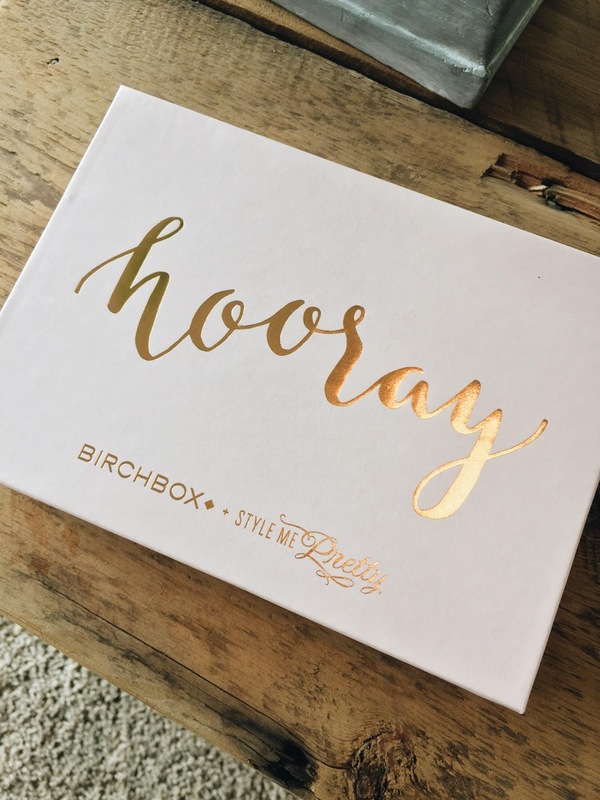 I belonged to Birchbox for a long time and came to cancel it when it seemed like I was getting the same samples over and over again in the mail. I decided to join up again when my cousin Candice, She's Leaning In , kept texting me her amazing monthly boxes. I decided to get back on board. My first box is the beautiful box you see below. I needed a bit of time to try everything and now I am ready to review it in full! 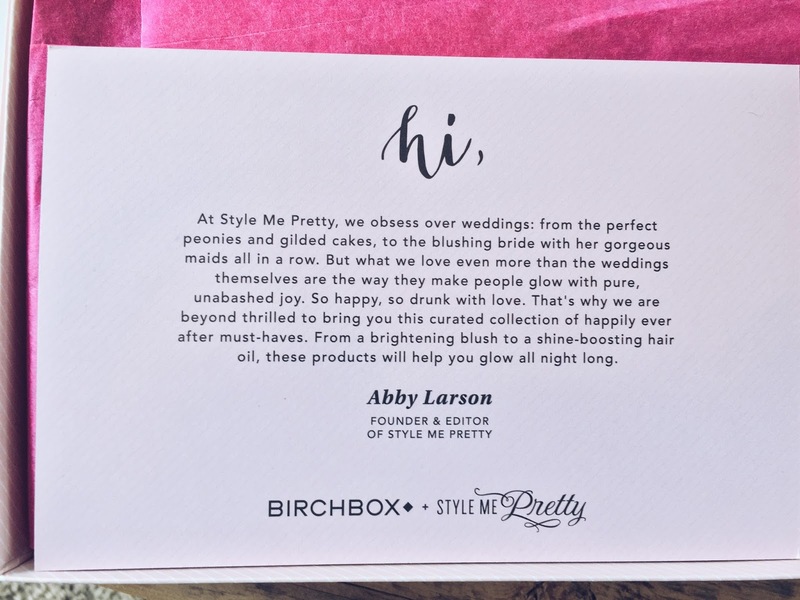 This was the Style Me Pretty box and it was bridal themed. I was a bride about 5 1/2 years ago so not really in need for bridal items, however I was happy it was more about beautifying than true 'bride' box. There was a fair mix of skincare products in this one, which makes sense if you are thinking bridal. I am always looking for the best skincare items. I am of the belief it is never too early to do skincare anti-aging products. So bring it on! I tried this for the first time a few days ago. It says that it is meant to smooth and to shine. I have tried products like this before and sometimes it adds almost a greasy residue or does not work as much as you would like. I have to confess that I am a maj Moroccan Oil fan, so I am hesitant to try other things. I was pleasantly surprised with this. It did make my hair a bit smoother and definitely reduced fly-aways. It also did not make my hair heavy or greasy feeling which was great. Even with second day hair it did not add to any oils in my hair. Overall I liked it. If I am being honest, $56 is too much money for me so I probably won't purchase it. I have received this before. Actually, I think twice before. This represents my innate problem with Birchbox and their repetition of products. I am pretty disappointed with this product. It has all the right things. A great name, the right description and it feels like it should work. It has kind of a grainy feel on the skin so it always seems like it should help clear off dry skin and make skin brighter. I have used it several times and each time it never really works the way I hoped. I have tried several drugstore make up removers. They all work relatively average. Every few months I tell myself "self, you need an actual make up remover." I usually find the wipes to be more of a nuisance and I just stick to soap and water. One time I got an amazing liquid make up remover from Birchbox and it was the best thing ever, unfortunately I don't remember the name. These wipes worked about as good as any drug store brand. They were sufficient and removed my make up but left some leftover mascara and lipstick remained. I will stick with my soap and water. Here is another item I have received before. Although for this one I was happy about. I seriously love it. Anything that helps to both moisturizer and even my skintone, I'm down. This is just the right amount of moisture and coverage. It is not heavy or thick which is great too. I do not typically like liquid foundation because it tends to be cakey and heavy but this is nothing like that. I think this is maybe the one item in this box I might actually commit to. This is not pictured, I forgot to include it in the box. It comes in a small, circular compact. This color is bright pink, they love bright pinks at Birchbox go figure, and is a powder with a golden undertone. I tried this one day and it goes on fantastic. The color is vibrant and I applied it with my finger, not sure if you are supposed to do that but whatever. Unfortunately I cannot speak to if it stays on all day or not because I had to take it off right away. The only reason I did this is because the color is a bit too pink for me, but if I could find a color I like I would totally do this too. Last but not least this embellished hair tie. 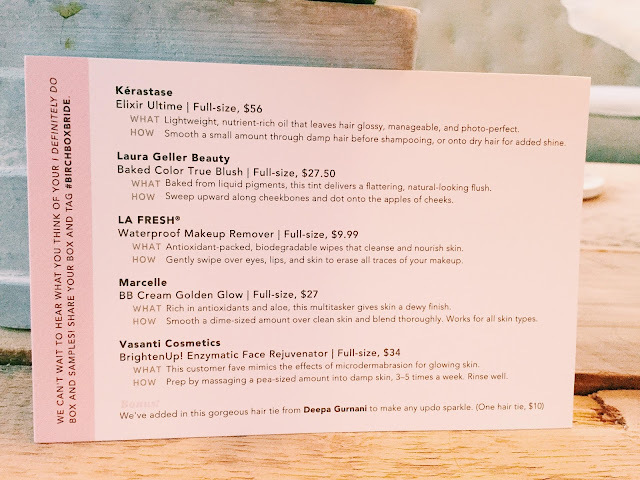 This is the classic Birchbox grab item. For a while it was food items, granola bars and the like. Once I got some enormous bobby pins that were white and blue. 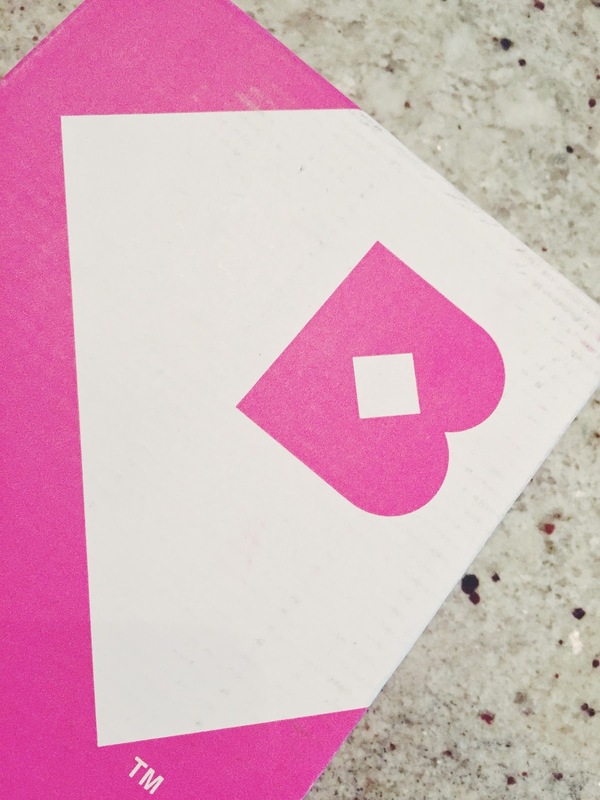 Where would I wear those Birchbox? Where?! This seems pretty, full disclosure I have not worn it. I am not sure where I would wear it either. I do not put my hair in a ponytail unless I am at the gym and this would look rather silly there :P I do have a wedding to attend Saturday and another one in August so maybe I will give it a try. I will keep you posted. P.S. I may need to back off on blogging three days a week for a while. As much as I love this blog I am in the midst of studying for a big test in my licensure and I need my focus to be there a few weeks. I will still be blogging but maybe less in the next few weeks. So stick with me please! I look forward to bringing more fashion to you all! I actually purchased a full size of the Vasanti. I loved the exfoiliating. Loved. it. Great post lady!